This is certainly a most welcome issue, courtesy of ArkivMusic’s ‘on demand’ service. On its original release, Jansons’ Sibelius First Symphony was hailed as the finest digital account thus far, and was praised to the hilt. I don’t find anything here to challenge that view and would have no difficulty in placing this as a prime recommendation. It is a shame that so few of Jansons’ EMI recordings with the Oslo Philharmonic are currently available - although some do crop up intermittently on EMI’s various budget reissue series. Indeed, to go by the paucity of Jansons issues on that label recently, it seems that EMI are overlooking one of the world’s finest conductors in favour of recording the Berlin Philharmonic in exactly the same repertoire that they have been espousing for several decades. Those lucky enough to be familiar with Jansons’ recordings of Dvořák, Shostakovich and Tchaikovsky with his Oslo orchestra will know what to expect; there is a freshness and vitality that is all too rare in the work of other conductors. Not a small part of this is due to the scrupulous - though never pedantic - adherence to matters of dynamics and phrasing. 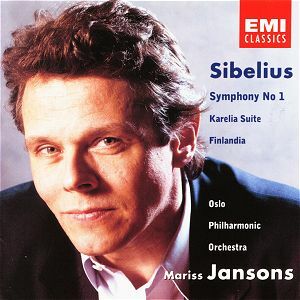 Jansons appears to have complete faith in Sibelius’s judgement as a composer, using the music itself as a foundation for his own interpretation, rather than seeking to enforce his own ideas upon the composer. As a result, this is perhaps one of the most exciting accounts of the symphony that I have heard. Nothing is exaggerated and yet there is a clarity and certainty of purpose that is utterly compelling. The first movement begins most atmospherically, with Leif Arne Pedersen’s baleful clarinet solo slithering mysteriously until the shimmering strings arrive to give us some sense of harmonic grounding. The strings are here, it must be conceded, glorious. There is an icy chill to some of the inner rhythmic motifs that contrasts with the warmth of the melodic writing. As the music builds, the sonorous brass choir enter, the horns roar exultantly … This is a big-hearted ‘bear hug’ of a performance, exhibiting a generosity of spirit that would be expected of a Barbirolli performance - or, perhaps controversially, a Bernstein. And yet there is never any doubt that Jansons has his gaze fixed squarely on the finishing line; for every expressive nudge here, or excitable stringendo there, there is no lack of forward momentum. The other movements fare equally well. In the Andante Jansons and his players create the requisite contrasts of mood and atmosphere. The Tchaikovsky-esque opening is beautifully played by the strings, with the ‘sighing’ appoggiaturas never over done and all the more touching for that. As the music becomes more restless in the latter stages of the movement, the Oslo players respond magnificently and there is some truly explosive brass playing. The third movement comes off very well indeed, as does the unusual (for its time) finale. All in all, I found this work more enjoyable, more involving than ever before. Except in the case of a handful of romantic and/or early twentieth century composers (Brahms, Mahler, Shostakovich, Nielsen, Elgar), there are very few whose first symphonies are both wholly characteristic and that stand up to the quality of their successors. In the past I had thought of Sibelius’s First as succeeding in the former, but not in the latter. After hearing this performance I must confess that I was wrong. As to comparisons, I would still not want to be without Sakari Oramo’s stunningly engineered account (reviewed here and here) or Maazel’s VPO account (review). Oramo’s performance is roughly equal in stature to Jansons’, although it has to be conceded that the CBSO in the early twenty-first century is about the best it has ever been and leaves even the virtuosity of the Oslo Philharmonic a fair distance behind. Oramo offers as couplings a slightly controversial account of the Third Symphony and a magnificent Finlandia. Jansons also offers a very decent account of Finlandia and an exuberant performance of the Karelia Suite. If it is simply a case of building a collection of the symphonies, then Oramo is better value for money - and if you want all of the symphonies under the same conductor then Oramo is certainly my first recommendation for modern recordings. Nevertheless, having finally heard Jansons’ recording of this symphony I cannot imagine ever wanting to part with it. On a final note, ArkivCD are now including reproductions of the full booklet notes that accompanied the original issues. Here we are given a straightforward and informative essay by Noël Goodwin.